It is hard to fathom that this year marks the 17th anniversary of the 9/11 attacks, a day that changed the course of history forever. 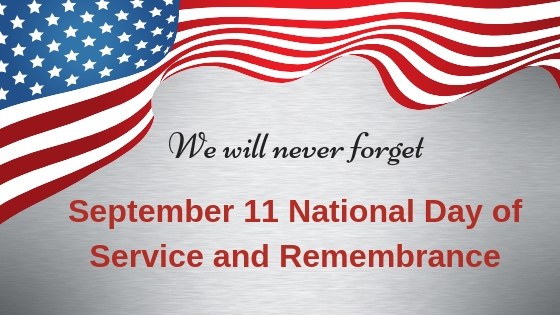 Also called Patriot Day and 9/11 Day, September 11 National Day of Service and Remembrance calls upon all Americans to not only reflect on the innocent victims and courageous heroes that were lost on that day, but to also pay tribute to them with an act of service. David Paine, co-founder of the nonprofit organization, 9/11 Day, which was a driving force behind the establishment of the annual observance, explains the reason behind its creation on their site, 911Day.org. "Ultimately we wanted something positive to come from the loss of so many innocent people in such a terrible way," says David. "We didn't want the terrorists to forever define how 9/11 would be remembered. We wanted to focus instead on how our nation came together, the spirit of unity and compassion shared by so many." Their efforts have been a huge success as tens of thousands of people every year take part in the Day of Service helping to strengthen communities across the country. You can search volunteer opportunities in your area using 9/11 Day's searchable database here. If you are unable to volunteer in person, you can still make a great contribution to the cause when you raise needed items for your favorite local charity on YouGiveGoods, the simple and free platform for raising brand-new goods for any charity. And remember, while it is ideal that you volunteer on 9/11, an act of service any day of the year contributes to the overall movement of compassion and unity. Part of remembering the day is making sure kids who were not alive or were too young to remember are taught about the events of the day. 911memorial.org has created a program called, “Anniversary in the Schools”, for educators to share history, events, memories and reflections with their students on September 11. They’ve even made this a collaborative experience by offering live chat for students to ask questions with Memorial Museum Education staff standing by to answer. Learn about the program here. Finally, let’s all be sure to take the time to reflect on the day and how we will personally work to bring about good from such tragic loss.